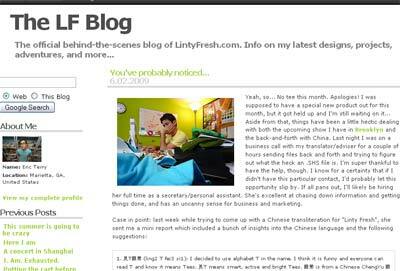 The plans at Linty Fresh are still a little unclear according to the blog but they definitely seem very exciting. Eric Terry, the founder, recently did a three month stint in China and set up production partners to take his wears across the Pacific pond. He’s going even further to set up branding in China and warehousing. That all indicates less of a production/sourcing/importing to the United States set-up and more of a physical presence in China for sales set-up. I have been involved with overseas apparel production and outsourcing and while there are many advantages, there can be just as many disadvantages. I have a feeling with a sharp guy like Eric, he is aware of the pitfalls and has found a way to make them work for him. Good luck Linty, we’re looking forward to watching your future success. not sure what is the big deal on shipping international. we have been doing it since day one. i see many shop that donâ€™t and people ask all the time if we ship international. i have Endicia, i add an international shipping address. print labelâ€¦Â what is the big deal? am i missing something? Yes, you are missing quite a bit. Linty Fresh has set up production partners and secured a retail location overseas in China. Having an actual physical presence internationally is a little different from printing a label and sending a shirt overseas. Btw, the #1 reason small t-shirt shops don’t ship internationally isn’t because you have figured out the magical formula of printing a label and they haven’t. It is because they don’t want the hassle of increased credit card fraud.